1908, oil on canvas, 31 7/8 x 24 1/4 ins(81x54cm). Reuben and Edith Hecht Museum, University of Haifa, Israel. 1908, oil on canvas, 31 7/8 x 21 1/4 ins(81x54cm). Reuben and Edith Hecht Museum, University of Haifa, Irael. 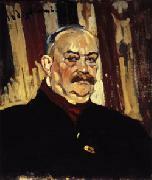 1906-1907, oil on canvas, 14 x 11 5/8 ins(35.5x29.5cm). Private Collection. 1909, Oil on canvas, 21 3/4 x 19 3/4 ins(55x50cm). Private Collection, New York. 1911, oil on canvas, 21 5/8 x 15 ins(55x38cm). Frances I. and bernard Laterman, New York.